I chose this route for a few reasons: A) it’s world famous for it’s epic scenery and cycling friendly roads, B) it’s a point-to-point route that allowed someone like me to literally ride as far as possible, with a few staged exit points, at Lake Louise (235km), Banff (288km) or possibly even to Canmore (312km). C) it serves up some leg torching elevation gain, making it not only possible for me to ride far, but also climb big adding some additional legitimacy of the ride, at least in my mind. With this type of ride and the route picked, all that was left was to pick when, so naturally I chose to do it as close to summer Solstice as I could, taking advantage for the long hours of light here in Alberta. With all that settled, I still kept coming back to one nagging question – what was it I was doing? Was it a ‘longest ride attempt’? A ‘max distance challenge?’ I wasn’t aware of any term to properly describe it, but I was aware of something called ‘Highlining’, which sometimes refers to walking across a wire, high over a gorge or canyon, but if you’re from around here, it’s more commonly referring to a winter sport when you rip up a nearly vertical steep mountain side on a snowmobile to see who can hit the highest point before stalling out and turning back down. The one who sets track in the snow to the highest point holds the highline. When I thought about that, it seemed to fit. A ‘highline ride’, could be an attempt to ride out and set your own distance highline mark. And what I liked about that even more, was that in the case of the route I’d planned, the Icefields Parkway, I had the opportunity to not only set a new personal distance highline, but also a climbing highline, in the same ride. This was starting to feel like a solid concept – one that I felt quietly inspired by. 3:30am, my Rock Clock alarm went off. 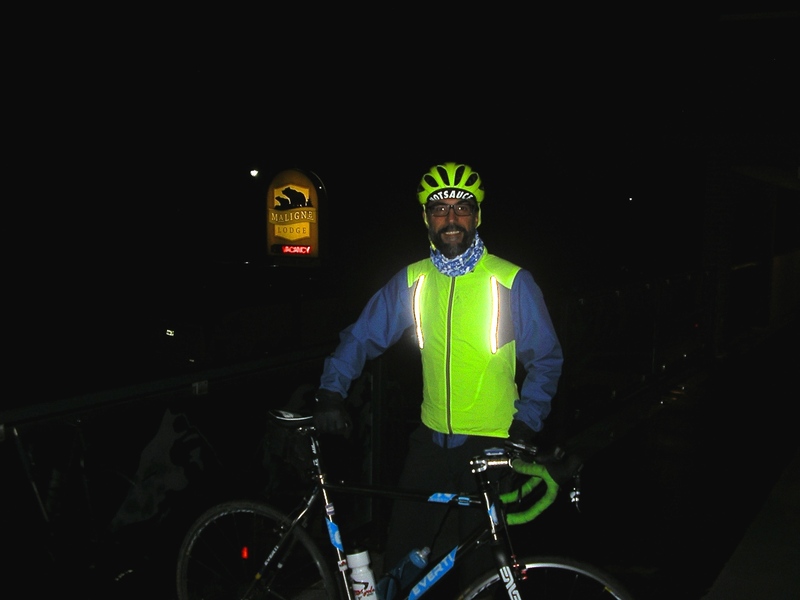 I had an hour to wake up, eat, get geared up for rain and 8 degrees, and roll out for my 4:30am start. Big surprise here, was that although the sun isn’t quite up yet at 4:30am, in Edmonton the sky is already light and you can see pretty well – this wasn’t the case in the mountains. Leaving Jasper, the sky was light, but the surrounding mountains and forest were a blackout. Add rain, I couldn’t see much at the start. This made for some interesting first 20km… Not a single car went by, as I followed the beam of my bike light down the highway center-line, buffering myself from whatever wildlife might be hanging out in the roadside darkness. 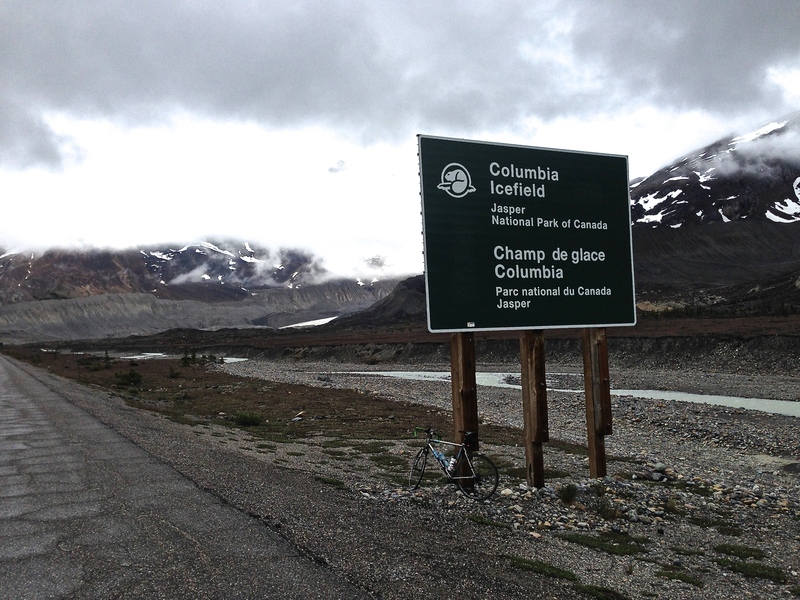 9:35am, I was 100km in, and 10 mins ahead of schedule as I rolled up to the Columbia Icefields for my first planned major rest stop. My support team, my Dad, wife and kids, were all there waiting. My pace was almost bang-on. But my legs felt pretty gassed for only 100km. The cold morning, the headwind, the rain, and most of all, the killer climb leading up to the Icefields with near 14% grade, took its toll. When I got to the top, never mind a match, I felt like I’d burned the book. So, I fuelled back up quickly, kept the stop shorter than planned, not wanting the weight of fatigue to take hold, and I headed back out 15min ahead of schedule. Just a few km down the road, uncertainty crept into my mind, like a mosquito into a tent. As a continued to grind my way up hill into the SW headwind, I toyed with my first thoughts of pulling the chute. The next planned stop, at Saskatchewan Crossing, would put me close to 160kms, or 100miles, and very near my existing highline mark of 163km. I figured if I got there, and the weather was still bad, I could just roll out another 10km and call it a day. This thought was a fleeting one; one I didn’t take seriously at that point, but it gave me an odd level of comfort, knowing I had a ‘theoretical’ fall-back position if the wheels fell off. Fortunately, at six hours in, the weather had improved. It was warmer, the sun was peaking down at me through the broken clouds; the rain had stopped long enough that I was nearly dry again, and most important of all, I was finally headed back down hill! Winds were not on my side, however… Downhills like these should have been white-knuckle rippers! 80+kph screamers that make you question your sanity when that little voice in your head asks you, ‘um, is this safe?’. But, the winds were big enough that those speeds just weren’t in the cards. I hit a max speed of about 60kph, by pedalling… Instead of asking myself, ‘is this safe?’, I was checking to see if my brakes were rubbing? But still, after the climb up to the Icefields, I was happy with any downhill action I could get – and despite the winds, (and my wasted energy cursing the winds), I rolled into Saskatchewan Crossing nearly 40 mins ahead of schedule and my outlook had markedly improved. It was midday, I was dry and I was ‘already’ 153km in. Things were looking up! But, this is the mountains, so 30mins later as I saddled up again, the pendulum had swung right back on me; the rain was back, I was soaked through in no time, I was cursing the wind again, and knew I was soon headed back uphill. Lake Louise waited only 79km ahead, but with Bow Summit between me and it, at that point, Louise felt like it might as well have been on the dark side of moon. 2:00pm, I caught up to my support team at Waterfowl Lake. It wasn’t a planned stop, but I’d been pushing and was still 30min ahead of schedule so I stopped to check in, and grab a fresh water bottle. The last 10km had felt faster; I was feeling better after my lunch at Sask Crossing, and I was even starting to think about the possibility of pushing on past Lake Louise, for Banff. The problem was, when we went to open the hatch to the SUV to get my new bottle, it didn’t open. 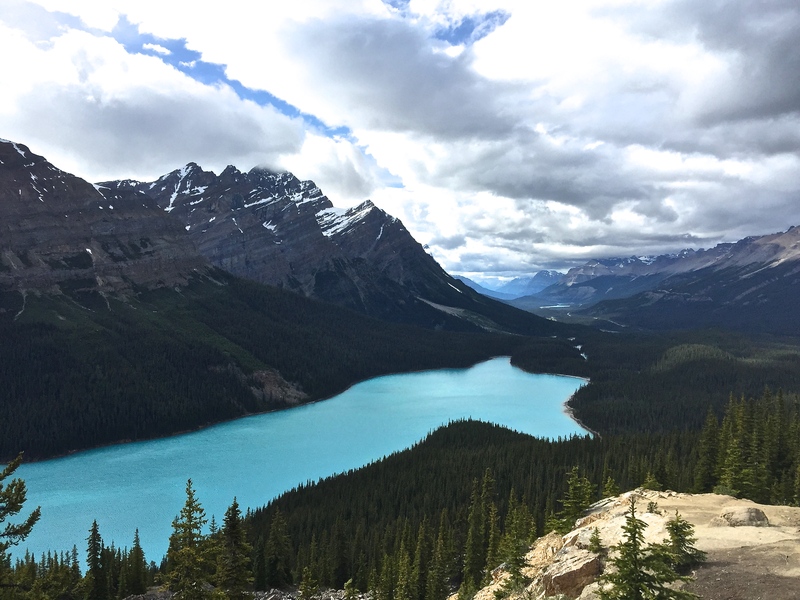 The remote fob battery was dead… With my family there on the side of the road, locked out of the vehicle, and no cell service in the valley to call for help, I couldn’t continue on to Lake Louise until we figured things out. How quickly things had changed again… Fortunately for us, eventually a Parks Ranger came by, and used his radio to call for AMA roadside assistance, but they needed to come from Banff, so all in, by the time we were all back on the road again, we’d lost three solid hours… Now, it was 5pm, the sun was getting lower in the sky – I was only 170km into the ride, and I still had 60+km and Bow Summit to climb just to make it to Lake Louise! I had some work to do and it didn’t feel like time was on my side. 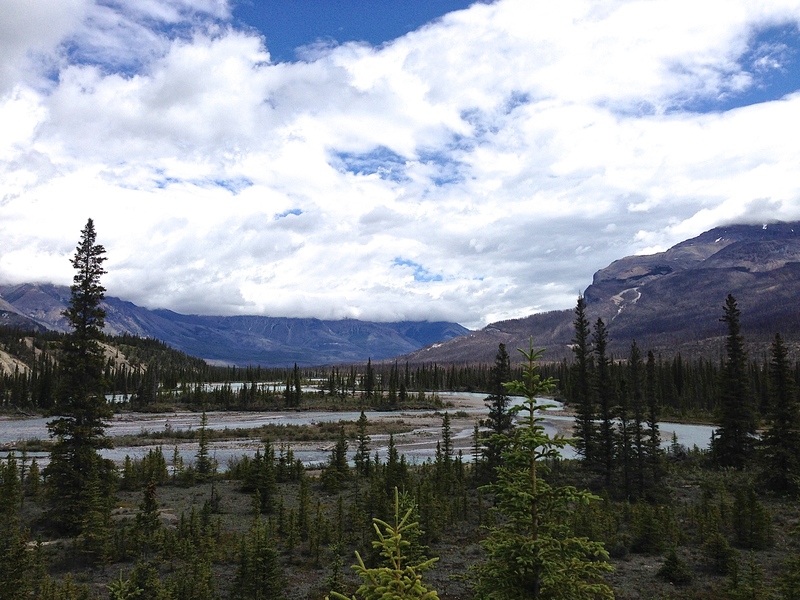 Bow Summit… is a sustained 40km climb that burns you down, slow and deep. It starts at 1,400m above sea level, and for the first 35km, slowly lifts you like a boat on the tide, up to just over 1750m, before the wave breaks and you’re shot up to nearly 2100m over the next 5km. It’s also the kind of climb that messes with you over and over, tricking you in to thinking you finally see the top, and then just as you approach, it pulls it away around the next corner. It’s a massive push by any measure, but when you’re cresting the 200km mark of your ride, it has the potential to be a plutonium-laced, lactic acid filled wrecking ball. Call it gained experience after the climb up to Icefields, or call it what it really was, simply being too tired to do anything else, but I held an easy pace on this climb, all the way up, focusing on just keeping the legs turning in nice easy circles, so when I got to the top, though I had to stop and put out the lactic acid flames, I knew pretty quickly that somehow, I still had a bit more in the tank. Sitting on top of Bow Summit, looking out across the valley, I felt like things were back on track again, to at least get to Louise. Climbing Bow Summit, was 100% pure sufferfest pain, but flying back down the other side was pure ‘kid with their first bike’ kind of joy! 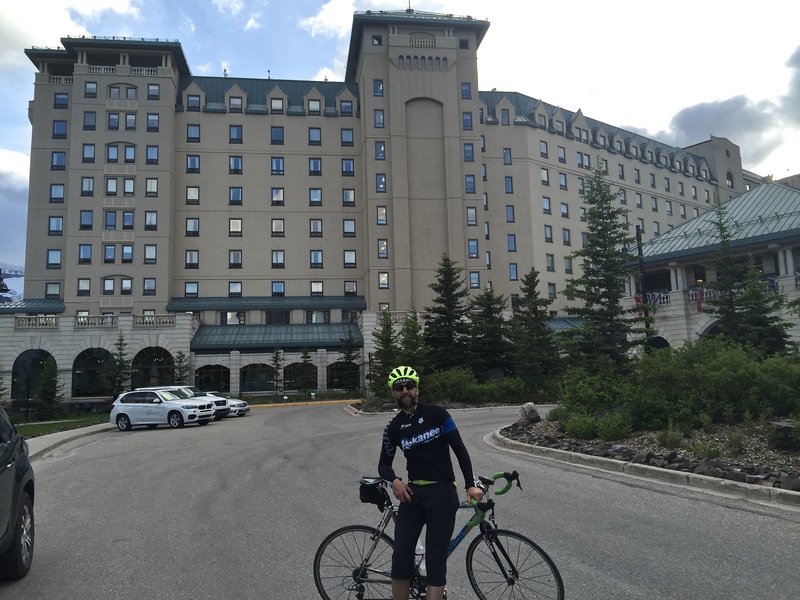 45km of sustained and glorious general downward tarmac, from 2100m to Lake Louise at 1550m… Woooosh! Nagging headwind be damned, that section was some of the most incredibly beautiful and enjoyable road riding I’ve ever done. 7:30pm, finally in the town of Lake Louise, and 240km on the odometer, I knew there was no pushing on to Banff. It was another 50km and on some seriously tired legs, I wasn’t sure I’d get there before it started to get to dark. That said, I didn’t want 240 to be the final number, so just for posterity sake, encouraged by my support team, I made the push up the mountain to Chateau Lake Louise, and back down again to get to 250.5km and a solid 3079m of climbing, officially making this my new highline, for both distance and elevation. That felt pretty good. Reflecting back on the ride now, so many things need to go right to do a long ride like that, from training, to health, to weather, to logistics like food and water, to avoiding mechanicals/flats, not to mention the dreary thought for crashes and injury… When it comes to a highline attempt, fitness is just one factor. So many other things can ‘beat’ you. 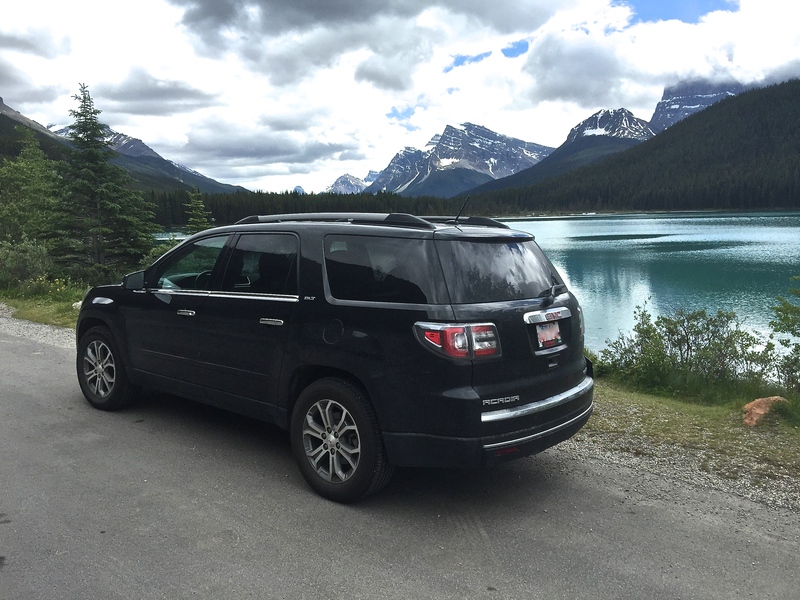 For me, without that delay at Waterfowl Lake, although I may have had time to push on to Banff, and go for 300km, who knows… In any case, that’s just not the way it went down – my highline ended at 250km. Now starts the planning for the next one, and how to get to 300km, or should it be 330km to make it a nice and pure 200mile double century…? Jasper – Lake Louise Higheline Ride 2016 from Sheldon Smart on Vimeo. I too wondered a few years ago how far I could go. Far is the answer I found. Great job Sheldon! Heck of a story and an impressive feat!